“Content is where I expect much of the real money will be made on the Internet, just as it was in broadcasting.” ~BILL GATES, January 3, 1996. In 2013, “content” finally appears to be THE hot tool in the marketer’s toolbox, indeed. 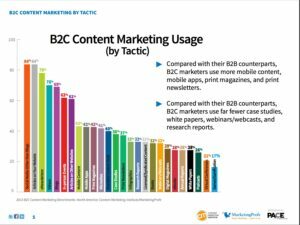 According to a Marketing Profs’ 2013 study, “B2C Content Marketing: 2013 Benchmarks, Budgets, and Trends—North America,” 86 percent of B2C marketers use content marketing, employing an average of 12 individual tactics. “It’s safe to say that brand journalism, or branded content, is making a comeback in a big way, and it’s exploding on the Internet in the form of sponsored blogs, forums, digital channels and independent sites. Of the 26 tactics identified in the Marketing Profs’s survey, “social media other than blogs” and “articles on your website” were used by 84 percent of those surveyed. Other tactics, by usage, include: eNewsletters (78%); videos (70%); blogs (69%); in-person events (63%); articles on other sites (61%); and mobile content (43%). 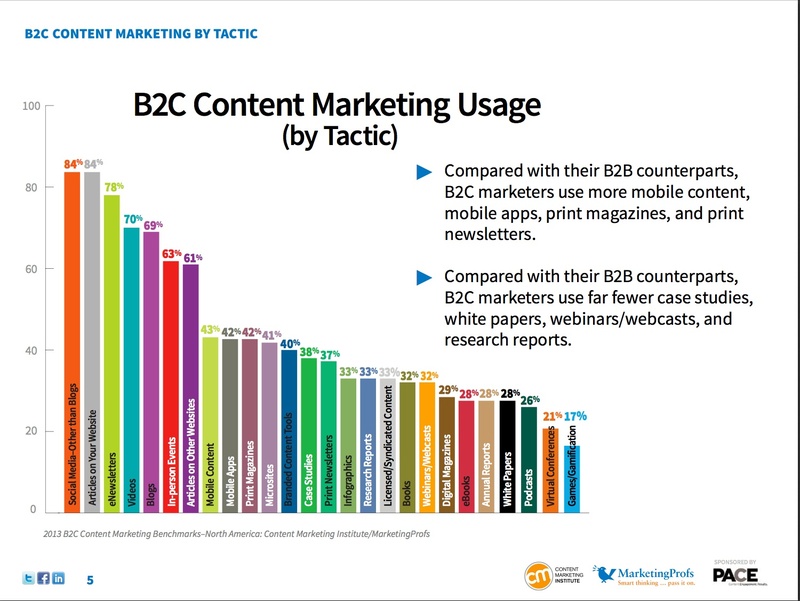 I found it interesting that print newsletters (37%) and books (32%) still showed up on the tactic list. In fact, they topped digital magazines (29%), eBooks (28%), and virtual conferences (21%). BUT, with the volume of content being published online each day, it is essential that we create content that will keep us front and center. To accomplish this I am not suggesting that we do anything outlandish, controversial, or unethical. I am, however, solidly in the camp that thinks there’s definitely room for improvement—including improvement for law firm content. Here are my top five content strategies. May they inspire and empower you on your quest to craft and position your content effectively. 1. Clients don’t care as much about your services or products as they care about themselves. If we believe this, and we should, then the majority of the content we produce for marketing purposes cannot be about ourselves. In order to create a trusted, meaningful, and even emotional connection with our brand (either the individual lawyer’s brand or the enterprise), our content must be based on our desire to fulfill our clients’ needs and interests. By providing diverse and relevant content you can demonstrate what you do and what you know without hitting the reader over the head with board. Ouch! 2. Be strategic, really. Know what you want your words to achieve BEFORE you even write, record, or utter the first word—content is not about words, it’s about communicating. Whether short or long form, taking the time to think before you write or publish is essential for ROI. (a) Think about your message—what do you want the reader to take away? Understand why readers should care. Focus on one key benefit. Skip the features. Don’t combine or confuse messages. Make your case. (b) Write a statement about the message. Not the message, but a brief statement that defines what you want your message to achieve. Start from the end and work backwards. Using this post as an example: What do I want my words to achieve? Everything in this post should be communicating that message. Feel free to let me know how I did in the comments! (c) Who is this content speaking to? How will your message be received in real life—what will it mean to recipients? What does it feel like to be them? Where might they be? What might they be in the middle of doing (most of the content we consume is in the midst of trying to accomplish something important) when they encounter your content? Be sensitive to your intended audience. (d) What do they need? Do they need visuals, statistics, tips, more resources (links to similar content), practical suggestions, stories, or case studies they can use to influence decisions? Should you include or eliminate jargon, acronyms, or references that diverse readers may not understand? (e) With a clear picture in your mind, you can begin crafting your content. The more specific you can be in the “thinking” stage, the better you will be able to leverage the content to mutual benefit. A strategic road map, put down in writing, for each piece of content you endeavor to produce will help you benchmark your progress and revise direction when necessary. 3. There’s more to content than content. Design, accessibility, and promotion can lift your content above the noise. (a) Design. How you present your content can make a difference in how it is received. Layout, typography, photography, charts, info-graphics, illustrations, and “share-ability” are important considerations. Some sites have built in styles so you can’t do much about that, but where you do have control use and trust the instincts of professional content designers. This may sound like over-kill to some, so take it or leave it. At the very least try to be as clever as possible with what you have to work with. (b) Accessibility. Content should be available from multiple channels, and thus multiple formats. Repurpose your content across media. Sometimes this can be automated, other times it needs to be manually orchestrated. If you can put your content in a responsive container, do it; i.e. desktop, tablet, and mobile. If you can’t, then upload similar content minding the particulars of various channels appropriately. Don’t forget print. Some people still prefer the printed page and providing this, too, may actually be one of the great differentiators these days! (c) Promotion. Content deserves a real distribution plan. Get one and execute it well. Keep abreast of changes to search optimization. Include a component in each piece of content that can be easily shared on social media to increase your exposure. For example: images and graphics are great for sharing on Pinterest, Facebook, Twitter, and etc. ; quotable material should be highlighted to make it easy for journalists and bloggers to use; add a 100 character call-out that can be dropped into a Tweet—leaving 40 characters for the person to add a few words or @you; give slide decks you use in live presentations new life on Slideshare and LinkedIn; and, video should lead with the answer—put the message brief (the take away concept) at the beginning of the clip. >>>Although YouTube makes it easy to share a clip starting at any point in the video, a lot of people do not know how to use that feature. Also, consider that the first frame of the clip displays on embedded or shared video, so choose that carefully, too. 4. Get. Help. Copy editing and proofreading are essential to good writing – ask any professional author or journalist. I edit a lot of articles, blog posts, status updates, and book length material written by lawyers. I can honestly report that things like clarity, parallel structure, transitions, and grammatical conventions are often missing. The knowledge imparted in content can be top-notch, but if the writing is boring or lacks clarity, you will lose readers, and thus, opportunities. Considering that most lawyers think themselves great writers it may be difficult for them to accept the mark ups. But content for public consumption must represent the level of professionalism that your brand seeks to convey. A good copy editor and proofreader can help you with all of the above. If you don’t have in-house resources, hire an outside editor. It will be money well spent. 5. Content is a gateway. Every piece of content you or your law firm produces and publishes is a gateway to the buyer during any one stage of the buyer/seller process. There are five stages of the buyer process: awareness; knowledge gathering; consideration; purchase; and loyalty. Connecting your content to buyers in any stage can produce rewards. Therefore, you are wise to identify the stage that each piece of content you produce addresses, and use that to your advantage. Consider any comments or contact information from readers that you receive. These are live leads. Try to understand where they are in the buyer process and then reach out and follow up with them appropriately. Take the next step toward establishing personal contact. This is the hard part for a lot of people. It may help you to think in the big picture—your content is working FOR YOU. You do not work for it. Don’t ignore it or think that you can’t understand the data and act on it. You can. If your content is not delivering real world opportunities—those that serve to establish or maintain relationships in the marketplace and that lead to new business—then you probably skipped one of the previous steps. Go back to the beginning, and think smarter. LawGravity offers content development, publishing, and strategic consulting. If you would like to learn more about how we can work together, please contact us.